Happy memories - these delicious beans in tomato sauce reminds me of the time when I lived in Greece – in a small village up in the hills on the island of Crete. I cooked this dish a lot – using butter (Lima) beans, olive oil made from my neighbour’s olives and herbs growing wild outside. I always ate it with some gorgeous feta cheese. When I cooked this dish in Greece, I always used dried beans that I soaked overnight and cooked the next day. Nowadays I must admit that I often use cooked, tinned beans – an organic variety if I can find it. If you want to use dried butter (Lima) beans - once you’ve soaked them over-night and rinsed them – cook them for an hour before adding them to the tomato sauce and simmer for a further 30-40 minutes, until the beans are really soft. I add a fair amount of herbs to my tomato sauce – fresh or dried or a mixture of both, whatever I’ve got at hand. You can add fresh herbs like oregano, thyme, basil and a little bit of rosemary – or use mixed dried herbs. You can use tinned tomatoes but buy the best variety you can find. The same goes for fresh tomatoes – look out for ripe, ruby red, fragrant tomatoes. 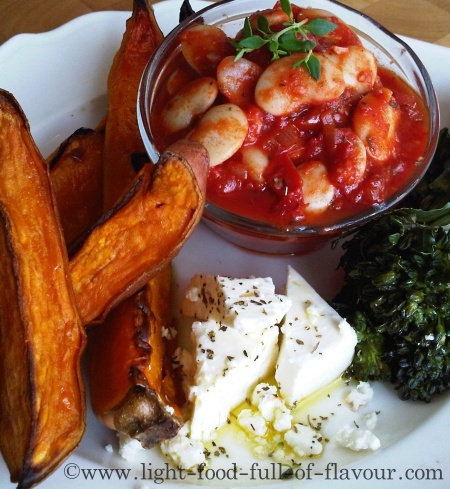 To make this a super-tasty and ultra-healthy meal, I serve these beans in tomato sauce with oven-roasted butternut squash and sweet potato wedges, tenderstem broccoli (broccolini), a really good feta cheese and a salad. I’ve said it before, and I’ll say it again - when buying feta cheese, make sure it says that it’s made from sheep and goat’s milk – there are some bad imitations out there made from cow’s milk. 1. Pre-heat the oven to 220C/Fan 200C/425F/gas mark 7. Start by making the tomato sauce. Place the olive oil in pot over a low heat. Add the chopped onion and garlic and stir and cook for about 10 minutes, until the onion is really soft but not browned. 2. Add the chopped tomatoes, tomato puree, herbs and balsamic vinegar to the pot and season with some salt and black pepper. Bring to a simmer - stirring every now and then – and let it simmer over a low heat for 30 minutes. Add a bit of water if it gets to thick. 3. Cover an oven-tray with baking parchment. Place the squash and sweet potato wedges on the tray and brush them with a bit of olive oil and season with salt and pepper. Place the tray in the pre-heated oven and cook for about 35 minutes, until the wedges are nicely browned and soft. 4. Add the beans to the tomato sauce and simmer for a further 10 minutes. Taste and check the seasoning. 5. Steam or boil the broccoli. Serve the beans in tomato sauce and vegetables with feta cheese.